There's a feeling of pride when you are able to achieve a goal all on your own. For years now I have pined to one day own a luxury bag but I never rushed it. I knew that if I waited the opportunity would present itself. I have always been a prideful person and when I want something I want to achieve it myself. It means more to me. I told myself that I want to purchase my first luxury item. I didn't want anyone else to buy it for me except me. By purchasing the item, it would mean independence, strength, hard work and self satisfaction because at the end of the day no one can take that away from me. It came from me! I earned it and I achieved it. I was really nervous when I walked into the Gucci store to purchase the Dionysus bag. I read and watched reviews of individuals have a horrible experience at luxury stores. Sales associates being cold, not helpful and behaving pretentious towards the customers. In my mind I worked myself to assume that someone would treat me this way. Thankfully however, I was wrong. The woman that helped me was so friendly and when I told her that this was my first time purchasing a luxury bag she said thank you for choosing Gucci and went out of her way to make my experience comfortable. When I left the store I felt so happy and the experience to this day felt unreal. I don't come from much. My dad was the bread winner and worked hard for his 3 daughters to put us in Catholic school and he made sure that there was a roof over our head and food on the table. When I got home that night I felt differently and I left the purse in the shopping bag in my room for 2 days until we left to New York for fashion week. My behavior was strange and to this day I can't fully explain it but part of me felt unworthy to have such a luxury item in my home. I also started to feel insecurities and worried that I would come across as show offish with a Gucci bag. I guess my humbleness made me feel unsure of myself. At the end of the day I realized and told myself that I am still me. 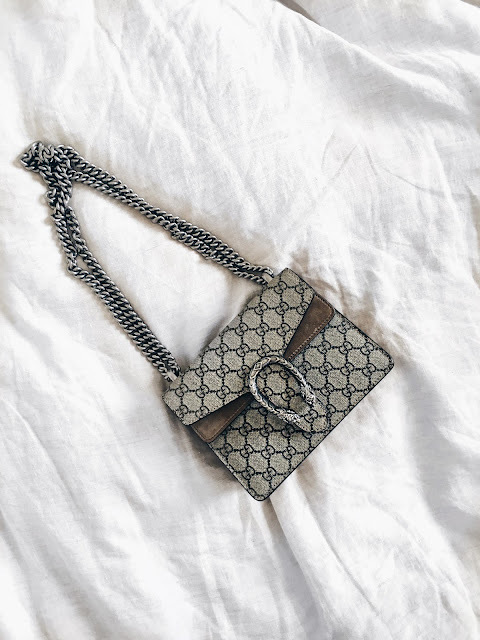 The Gucci bag is a beautiful piece of art that is glamorous and constructed impeccably but to me it means so much more. It has a story..my story and I'm glad to be able to share it with you guys! the greater you'll feel when you achieve it.